You are fully, completely, and thoroughly adored by God. And through His love you can live a life full of miracles. Miracles of healing and deliverance are happening around the world. But many people still struggle to believe that God will perform such miracles through them. Filled with inspirational personal stories and prophetic revelations, Living in the Miraculous challenges you to believe so completely in God's love for you that you expect the miraculous in your life every day. Your faith flourishes when you are rooted and grounded in God's love. When you really see who He is and get a glimpse of His affection for you, walking in His power becomes natural. About "Living in the Miraculous"
Customer Reviews For "Living in the Miraculous"
I was given this book, when I was very first saved. Set me up with absolute faith to live a life working in the supernatural. Miracles are so fun, there is no pressure. The Author displays the Fathers heart perfectly, and his DESIRE to work through us and heal! Loved this book, have since obtained another copy to lend out, as I think it is so important for all Christians to know and access their power through the Holy spirit! Living in the Miraculous was encouraging and enlightening. 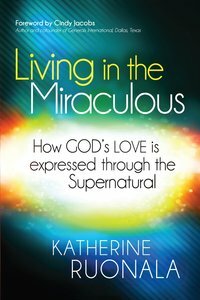 Katherine describes her encounters with the miraculous in such a down to earth way as though it is normal to experience miracles every day. I love the heart behind this book - if you are seeking to walk in the miraculous then you should read this book. This book opened my eyes to a whole new level of God's love for myself and others. Katherine Ruonala really does seem to know the love of God like I have never heard expressed from anyone before. Her explanation on how the miraculous occurs through our own revelation of God's love for us was brilliant. I have been spurred on to seek after more of God and His purpose for my life after reading this book, and have seen personal breakthroughs in my life also. My favourite book so far. Thank you Katherine! A wonderful adventure and insight into living a miraculous lifestyle. There are keys to accessing more of the supernatural in your daily life, that if applied, bring forth an abundance of fruit. God's love oozes out of this writing, I believe literally bringing people into a God encounter through Holy Spirit moving on people's hearts as they read this book. A blessing to those who take the time to soak in the depth of God's heart revealed powerfully through Katherine's life and ministry.